I just got back from a trip to the Tetons and Yellowstone, and, of course, I made a point of hiking to Yellowstone Natural Bridge (NABSQNO 12T-543257-4930475). A loop trail completely encircles the area where the bridge is, including going to the back side of the bridge from how I first saw it. At one point the trail goes near the top of the bridge and it was while I was standing there looking at the top of the bridge that I made an interesting discovery for myself. 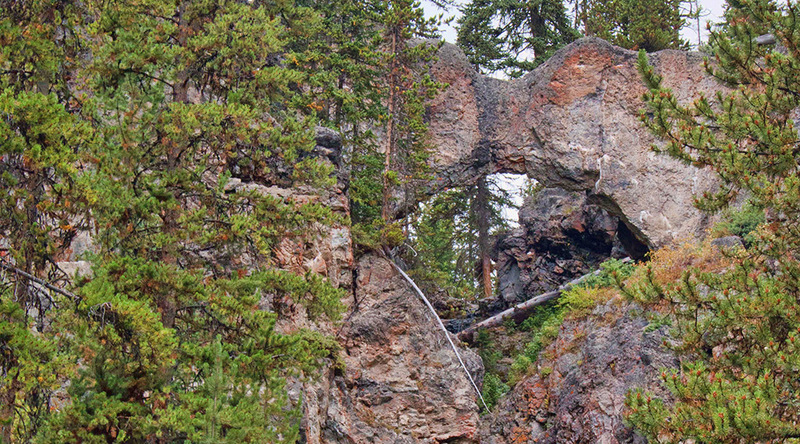 The Natural Bridge of Yellowstone is actually a double bridge. The informational bulletin board down below the bridge mentions its height and span at about 51 feet and 29 feet respectively, but doesn’t say anything about it’s being double. 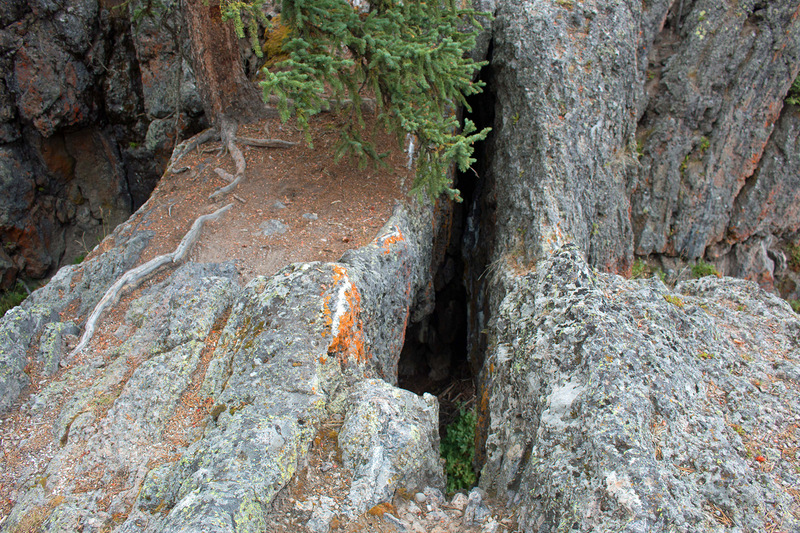 What I discovered is that behind the span that I first saw when hiking to the bridge there’s a good-sized crack that goes all the way through separating this front span from a second span that has a tree growing on it. As you can see from the first photo below, the front span has a rather narrow width and is almost pointed on top, while the second span is wider and more squared off. To get the photo of the top of the double bridge, I was standing up against the “Keep Off the Bridge” sign that the Park Service placed to one side of the bridge to keep visitors from walking on top or across the spans. 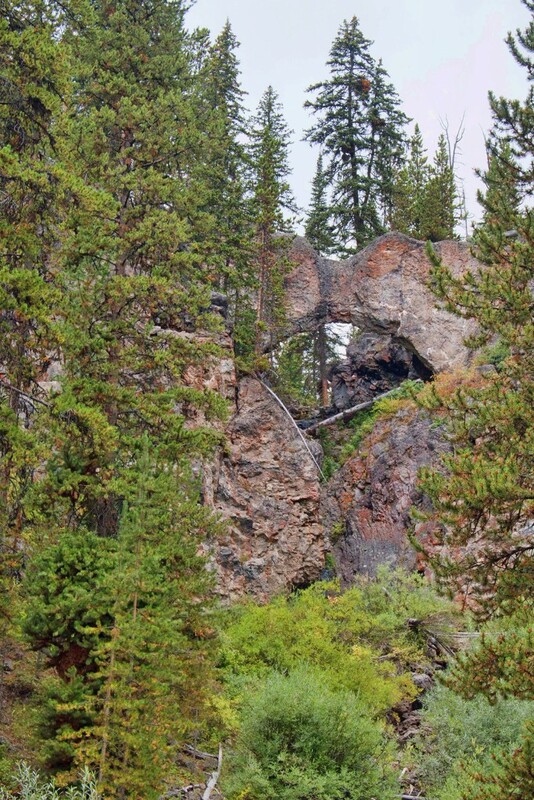 In Vreeland’s Nature’s Bridges and Arches Volume 19 he mentions the double nature of this waterfall-type natural bridge and gives the widths of the two lintels as 2 feet and 5 feet. The photo above shows the double nature of the span. The photo below shows the view from the standard approach.